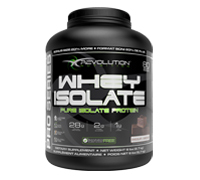 Revolution Nutrition™ Whey Isolate is a superior quality pure whey isolate protein formulated to give you maximum results. This product does not contain any other protein sources such as soy or milk proteins. Revolution Nutrition™ Whey Isolate offers the ideal solution for any health-conscious person seeking to enhance protein consumption within their diets! Along with its amazing taste it mixes easily in a glass or a shaker bottle. Drink it a home or drink it on the go! You can even add it to your favorite fruits, throw it into the blender and turn it into a delicious protein smoothie! Mix 1 scoop of Whey Isolate with 200 ml of water or your favorite beverage. Whey Isolate is a dietary supplement. Do not use as a unique source of food.